The role of councils in social care has shifted significantly over the last few decades, from provision of services, to commissioning and increasingly to personalisation by supporting people to choose and manage the support they want to meet their own needs. However, it has become increasingly difficult for local authorities to carry out this role as they have faced increasing budgetary pressures. 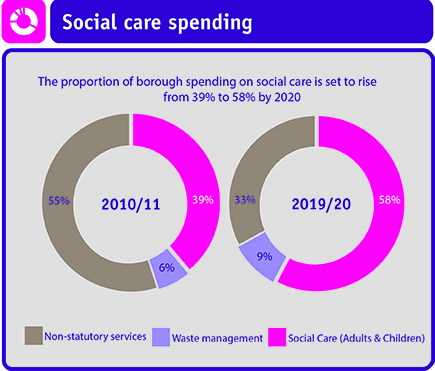 Social care is absorbing a rising proportion of the resources available to councils. The amount of local government funding allocation being spent on statutory services such as social care is expected to increase in the coming years. Prior to the Spring Budget 2017 London's local authorities were facing a funding pressure of up to £600 million in social care by the end of the decade. The announcment of an additonal £2 billion for social care will help to address some of the identified funding gap. The £2 billion will be allocated over the next 3 years - £1 billion in 2017-18; £674 million in 2018-19; and £337 million in 2019-20). London's share of the £2 billion funding for social care is £315 million leaving a funding gap of £285 million. People of working age with a mental health problem will increase by 14 per cent. Through research, and policy analysis, we are working to illustrate the long term funding pressures that local authorities face and we are lobbying government for additional funding to enable local authorities to continue to support the vulnerable adults in need of social care services. The debate on the role of integration in providing a holistic health and care service has been ongoing for a number of years. London Councils submission to the Public Accounts inquiry sets out some of the challenges to integration and some of the funding pressures that are facing the sector. Our report, supported by Ernst and Young and published in January 2013, explored the scale of the funding pressures on adult social care and the extent to which these could be mitigated through achieving greater efficiencies in the way that social care is managed, procured and delivered. A key finding of the report was an illustration that even if the most ambitious efficiency savings were to be achieved by local authorities the funding gap would still not be fully addressed without additional government investment. In July 2011, the Dilnot Commission put forward several recommendations for reforming the funding of adult social care. We carried out initial research to assess the potential impact of the commission’s proposals on the future funding needs for adult social care in London.